There are currently 86 online users. For anyone who lives in Texas, DCCCD is an affordable place to earn LL science credits. They have a better selection of online science courses for science majors than NMJC and Clovis do. They have I and II with lab for biology, physics, anatomy and physiology, and chemistry. Sometimes, they offer organic chemistry I and II. They have 8, 9, and 16-week terms during fall and spring. They have 5-week terms during the summer. In May and during the winter break, they have 3 and 4-week terms. The downside is that even non-degree-seeking students need to go through the admissions process and send all of their transcripts so that DCCCD can determine if they have the required prerequisites. Tuition is $59 per credit hour for Dallas County residents and $111 per credit hour for Texas residents outside of Dallas County. Has anyone applied and been accepted with their BA/BS from TESU showing a limited GPA? I noticed most acceptance posts are in Computer science or MBA programs. Just curious if anyone has been successful in being admitted to AState for graduate school. I'm helping my partner put together a plan to slowly complete what he started years ago... a degree! He's got some yuck on his transcript from withdrawing etc. So, I'd like to know what you guys think. Should he see if he can complete the Natural Sciences degree from TESU or Excelsior? And after that apply at the college of his choice? His end goal would be to go for a Masters at an online school in something like GeoPhysics. He can mentally handle it and it's what he's interested in, but he has a bunch of (old) low grades and W's on his transcript. He has a great job right now, but we'd like to have him prepare for a scientific career sometime down the road (mostly so we can relocate to the South and get some sunshine!). Priority for him is cheap (and must be self-paced, his work schedule can be whack) since he doesn't need the degree anytime soon, just something to work on while he has downtime. He's a veteran, if that makes any difference on college recommendations. We are not close enough to do DSSTs, but he can do CLEPs and any of the online stuff. I hope this shows up okay, I had to sit down at a real-life computer to put it all in a spreadsheet and copy it on here. Thank you ahead of time! I completed a course program at a regionally accredited vocation school. However, my transcript doesn't list credits; instead it has course hours completed. Would this be something that is convertible to credits and able to transfer into any of the big 3? I'm looking to start a degree in the same field as the vocational program was. Does anyone have experience/ have any information about this? Possible to apply towards elective credits or general education requirements? Woodpooky, you have private messages disabled so I cannot respond to your private message. Instead, I am posting it here since it is relevant to others as well. Private messages are disabled by default, so you need to change that setting if you'd like to use private messaging in the future. I have a rather odd question about the CIS from TESU. When you receive the degree does it show the concentration on the degree? Or does it just say the BABA part? The area of study/concentration is not shown on the diploma for degrees at TESU. It only shows the name of the degree itself, which is: "Bachelor of Science in Business Administration." Likewise, with my ASNSM in Computer Science, the diploma just says "Associate of Science in Natural Science & Mathematics." That said, the concentration does appear on the final transcript. So anyone who pulls a transcript will see it there. If you pursue multiple areas of study, your transcript is the only place they appear since TESU doesn't issue additional diplomas for each additional AoS. This is my first post, but I have this forum for the last two years and it has been a great help! I need options for my upper level course for my BALS at TESU. I have already taken all the DSSTs I can and would like to find a UL option I can just test out of and has no writing included. I attempted the Saylor course (organizational communication) and missed it by 2 points. So I am searching for the quickest option in hopes to be done by 1 May. Thank you so much. It's been a while since I posted last. We, Ed4Credit.com, are thinking about adding some new courses. Here is a list of the courses we are considering. Please give me your input. So I have enrolled in TESU, sent transcripts, took some free credits at Sophia, and put together a list of classes needed. 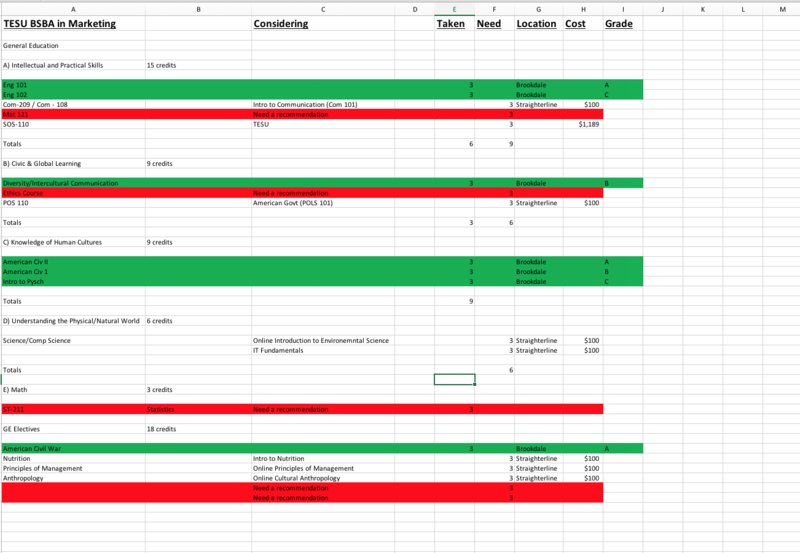 In the links below are my intended courses and plan of action; green is already complete and graded, red is where I am asking for input on which will be the quickest to complete, and white is decided on. If anyone can review with input and confirm I've got everything covered, along with help where I'm requesting a recommendation, I would greatly appreciate! Also, can someone confirm that between 2 TEEX courses and the 2 Sophia courses I took yesterday, that should cover the 6 free elective credits? My last question goes back to grades, my final semester of CC, I stopped attending - that lead to 4 Fs, I assume my only way to remove those is to retake the classes, otherwise that will drag my GPA down? Also, my reading on this forum leads me to believe if the transcript comes directly from the source, it will have a letter grade, but if it comes from ACE it is just pass/fail, is this accurate? Thanks again for all the great resources and people here!!! Hey everybody. Just wanted to let everybody know that SDC E-commerce course comes in as MAR-206 E-Marketing at TESU. They also applied it to my BSGM AOS on my unofficial academic evaluation which is what I was hoping for. I will report back with the results as soon as my official academic evaluation is complete. - Although temporary, is the transcript and diploma deemed as official? Will they be accepted by the majority of employers? - When will the official/non-temporary diploma and transcript be sent?